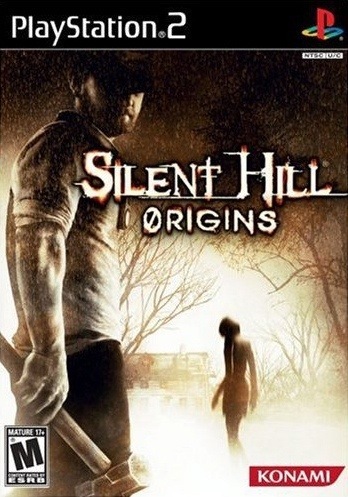 Silent Hill: Origins (known as Silent Hill: Zero in Japan) is the fifth installment in the Silent Hill video game series but it was chronologically the first game as the events occur before Silent Hill. It was developed by Climax Studios and published by Konami. It debuted on the PlayStation Portable in late 2007 and was ported to the PlayStation 2. Set seven years prior to the events of Silent Hill, Origins expands the backstory on which the series built itself. Note: The events of Silent Hill: Origins occur in 1976. Travis Grady, a trucker who suffers from visions that are somehow familiar to him, is running late for a delivery one night; he decides to make up for lost time by taking a detour through Silent Hill on his way to Brahms. On the outskirts of Silent Hill, a cloaked figure darts into the road in front of him; Travis slams on the brakes and exits his truck to check on the condition of the person. Outside his truck, Travis sees a brown-haired girl in a blue uniform. Chasing after her, Travis stumbles upon a house caught in a raging fire. He sees a woman outside of the house, but before he can talk to her, Travis hears a girl’s scream from inside and enters the house to find her. After making his way through the burning house, Travis discovers a severely burned young girl lying on top of an apparent sacrificial marking, and carries her outside with the safety of a seal. Upon exiting the house, he hears sirens in the distance and loses consciousness. The next day Travis wakes up on a bench in Central Silent Hill. After recalling the events of the previous night, he travels to Alchemilla Hospital in hopes of finding the girl’s condition. At the hospital, Travis briefly meets Dr. Michael Kaufmann, but is unable to find out any information, as Kaufmann claims that the hospital has received no new patients. On the second floor of the hospital, Travis is attacked by a nurse. After battling with the nurse and continuing his search in the hospital, Travis is confronted by a large mirror with an unusual reflection. On the other side of the mirror (which reveals the Otherworld), the brown-haired girl appears and Travis is transported to the hospital’s Otherworld. Later on, Travis encounters a convulsing monster and, after its defeat, finds a strange triangular piece belonging to an object known as the Flauros. The brown-haired girl appears, and Travis again loses consciousness to the siren. Back in the Fog World, Travis wakes up in the hospital lobby and meets Lisa Garland, a nurse who informs him about the sanitarium. Making his way through Silent Hill, Travis passes through the town’s butcher shop, where he witnesses the murder and mutilation of a nurse by a large monster called the Butcher. Once Travis arrives at Cedar Grove Sanitarium, he runs into Dahlia Gillespie, the woman he spotted at the fire. He questions her, and she gives convoluted and confusing answers, revealing that her daughter is Alessa Gillespie, the girl burned in the fire. During the exploration of the sanitarium, it is revealed that Travis’ mother, Helen Grady, attempted to kill him when he was a child, and that she was held in the female isolation ward. Voice recordings in the sanitarium tell of how Helen claimed she was “all better now” and wanted to see her son. Travis reaches his mother’s cell and finds her otherworld counterpart trapped in a large gibbet cage. After defeating her, he finds another triangular piece and Alessa appears as Travis passes out again. Upon waking, Travis finds a theater ticket and insinuates that he should check out Artaud Theater. In the theater’s main auditorium, he finds Lisa, who describes her dream of being an actress and teases Travis, displaying her “acting skills,” before leaving. Searching the theater, Travis encounters new monsters and learns that Alessa used to visit the theater when the actors were rehearsing their rendition of Shakespeare’s The Tempest. The character costume of Caliban frightened Alessa, and she quietly retaliated by psychokinetically giving the actor a headache and nosebleed. Travis discovers that he can change the theater stage’s props and scenery to create different Otherworlds. The final scene change reveals the dark and dreary home of the Caliban. Defeating the creature, Travis picks up another Flauros piece. By now, Travis has caught on to Alessa’s patterns, but he still has a great many unanswered questions. Alessa calls the siren and Travis once again falls unconscious. Travis wakes up in the Fog World theater and discovers the mutilated body of an Ariel. The corpse contains a key to the motel where Travis and his father Richard stayed while visiting his mother. Travis makes his final trek through the streets of Silent Hill, passing through a bookstore and a general store, and arrives at the Riverside Motel. Travis struggles through a long and dangerous stay at the Riverside Motel, involving many monsters previously unseen in Silent Hill, numerous transitions between the Fog World and the Otherworld, and various puzzles and searches. Travis eventually battles the Butcher, slaying it and using its blade to impale its corpse. Travis continues to seek answers regarding his family, and finds Dr. Kaufmann and Lisa Garland in a room with drugs and sexual tension between them; Lisa angrily storms out of the room, and Dr. Kaufmann follows her after threatening Travis and locking the exit. Travis escapes using a mirror in the bathroom and finally finds the key to the room in which he and Richard stayed many years ago. After opening the door to Room 500 and walking down a long diagonal shaft to another doorway, a flashback reveals that his father hanged himself from a noose here. Richard’s reanimated corpse tells Travis it’s time he “faced up to what happened,” and morphs into a screaming, tubular monster trapped in a box hanging from the ceiling. Travis painfully defeats the memory of his father and receives yet another piece of the Flauros. This time, Travis is visibly shaken and turns on Alessa when she inevitably appears. Once again sirens ring out and Travis collapses. Having fulfilled his purpose in the motel, Travis awakens in the basement of the hospital. Inside, he finds the center piece of the Flauros, and reconstructs the mystical item. Exiting the hospital, Travis is accosted by Dahlia, who accuses him of freeing Alessa. Turning back, Travis sees Alessa has regained her powers as she distorts the town into a burning, nightmarish state. He escapes into the streets of Otherworld Silent Hill, otherwise referred to as “Nowhere”. Using a child’s scribbled map, Travis escapes an overwhelming number of monsters and makes his way to the Green Lion Antiques shop, labeled on the map as “Go Here.” At the shop, Travis finds members of the Order performing another ritual on the burned Alessa. Travis is sedated with sleeping gas and drawn into a strange, nightmarish reality in which he faces the entity within the Flauros. Travis defeats the demon, and back in the antiques shop, a light shoots out of the Flauros and hits Alessa, creating a glowing, infant-like form on top of her body. This is when the various endings occur. Good Ending – Travis has successfully moved on from his past and finds himself back in the real world. While walking down the highway out of town, Travis sees his truck; he gets in, and sees Alessa holding a baby (Cheryl Mason from the first game) in his rear-view mirror. Travis smiles, taps his speedometer to reset it and show a fresh start, and drives away. Based on the events of the original Silent Hill and Travis’s cameo in Silent Hill: Homecoming, this is the canon ending for the game. Bad Ending – This ending is obtained by killing over 200 enemies in the game. Travis wakes up tied to a hospital bed, still in the Otherworld. A flickering light swings overhead and there is evidence that Travis has been drugged. As Travis struggles with his restraints, dialogue is audible in the background of people meeting Travis, and then screaming. Among those speaking are a woman who insists she isn’t his mother, his father, and the owner of Riverside Motel. There are also cuts to horrendous things, such as the Butcher’s cleaver stuck in a bloody block, Travis covered in blood in a room at the Motel, and shots of the Butcher. Though Travis struggles, he can’t free himself, and the camera zooms out to behind a two-way mirror, revealing what appears to be a cult member looking on. Based on a note found in the library Otherworld in the Theater, it comes to light that Travis may have been on a killing spree, and yet still mentally shields himself from his crimes. This makes him a perfect subject for brainwashing into the cult. This could also mean that the various “death by …” photos of naked women who have different means of death (by shotgun, stabbing, snake bite, overdose, etc.) located throughout Riverside Motel may have all been committed by Travis. UFO Ending – As with all Silent Hill games (excluding the fourth installment), the UFO ending is the spoof ending. After completing the game once, the player is given the option to climb the stairs opposite Alchemilla Hospital and obtain the key to room 502. This key is used in the Otherworld Riverside Motel. In a cartoon/anime style, Travis tries to open the door but it won’t open, even with the key. To Travis’ surprise, a UFO comes down from the sky and opens up, revealing an alien and the dog from Silent Hill 2’s Dog ending wearing a space helmet. They greet him and the alien reveals that his truck is on their planet. Joyfully, Travis asks if he could drive the UFO, to which the alien replies, “You drive stick?”. Travis joins them in their UFO and they fly away. The game features significant changes and additions to the gameplay, some of them being used for the first time in the series. Travis comes across a wide variety of power tools, household appliances and other commonplace objects, which he can stash unlimitedly in his inventory and from which he selects by cycling through them without actually pausing the game. With the exception of firearms (of which there’s a total of six), all weapons have durability, meaning that they will disappear after long periods of use (durability varies accordingly from one weapon to another). These include hammers, wrenches, screwdrivers, scalpels, batons, pokers, meat hooks, drip stands, etc. Rarer objects, such as portable TVs, filing cabinets, crates, toolboxes and toasters can only be used once before breaking, and deal considerably larger damage to enemies. Additionally, Travis can charge his attacks by holding ‘X’ for a large period of time before releasing it. Another significant addition is the use of the ‘grapple system’ when fighting monsters. Some of them will grapple with Travis and lead to a “quick time event”, whereupon the player must either tap a certain button repeatedly or press certain buttons at a time to avoid taking damage. Should the player miss the buttons too many times, or not press the corresponding button quickly enough, Travis will die. Origins is the first game to allow the use of bare fists for fighting. This is very useful if the player does not have any weapons ready. The energy drink item is also introduced into the game. Travis cannot run very quickly and will tire soon enough; should the player be in possession of an energy drink, Travis’ stamina replenishes for a large period of time, allowing him to run freely for a while. Unlike all previous games, there’s no difficulty setting (neither for action or puzzle). Like some of the games, it forces one specific ending (the Good ending) the first time the game is cleared. Silent Hill: Origins earned positive reviews by many reviewers, and received an award from GamePro as an Editor’s Choice. The game offered a unique look at the backstory of Silent Hill, providing eager fans the chance to expand their grasp on Silent Hill as a series. On the other hand, it met inevitable criticism by fans and critics alike, revolving around the storyline, straightforward gameplay, and the reuse of existing monsters.